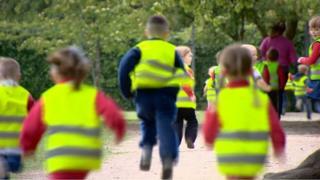 A Stirling primary school has pioneered a scheme to ensure all of its pupils walk or run a mile every day. Children at St Ninian's Primary take the daily exercise on a specially built circuit outside the school's playground. The "daily mile" scheme is credited with improving the health of pupils, and a number of other schools are now looking at copying it. The extra 15 minutes of exercise a day is in addition to PE classes. Head teacher Elaine Wyllie said the scheme was developed three years ago after a school volunteer realised the children lacked stamina. She said: "A volunteer in the school said the children weren't fit, and so we decided to test them. "We got some of the children to run around the field, but they couldn't - they were exhausted very, very quickly. "So we then thought, we have this path around the field, could we actually run them around it a few times and get them fit? "We did it with one class, and very shortly all the classes were doing it - it was that simple." The daily exercise is not timetabled; teachers take their classes out at a time of their choosing. P5 teacher Martin Anderson said the children were only out of their seats for 15 minutes. He said: "It's really not time-intrusive at all. "It's also developing the children's social, emotional and mental wellbeing. They're able to come outside and socialise with their peers in a different way than they would at lunch or playtime." Stirling University is studying the children's health and wellbeing, and a number of schools have already copied the "daily mile" initiative. At a time when UK-wide studies suggest up to two-thirds of primary school children lack basic fitness, Mrs Wyllie said the scheme is a perfect, and free, solution. She said: "The benefits according to the staff, the parents and the children are that the children are fit. Not one of our 57 primary one children are overweight as measured by the nurse. "The children are fit and healthy, they come in energised ready to learn and focused, apple cheeked and bright eyed."